Yum! Looks so much like cotton candy that I have to resist taking a bite. 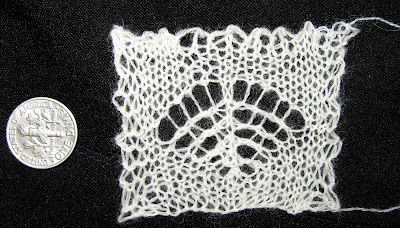 The pattern is Swallowtail, (Interweave Knits, Fall 2006)--a charming design from Evelyn Clark. The yarn is the Count 5 mohair I bought at Yuzawaya a few weeks ago--soft was goose down. This confection is providing a much-needed respite from the incessant K3togs and P3togs in my Spider King. I had to rip out a row today because I read the pattern sequence incorrectly. That's the first actually tinking I've had to do, but it was a real annoyance undoing those P3tog stitches with a pin. Fooey! None of these photos have anything to do with knitting, but I thought them intriguing enough to post them here for your enjoyment. 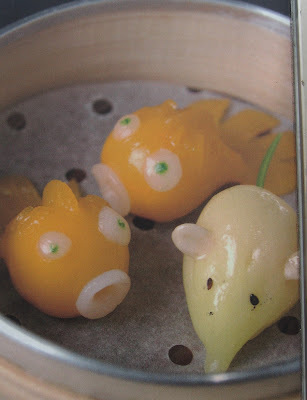 ...followed by a splendid presentation of Chinese desserts. And lastly, a wonderfully bizarre advertisement for Healthy Junk Food. 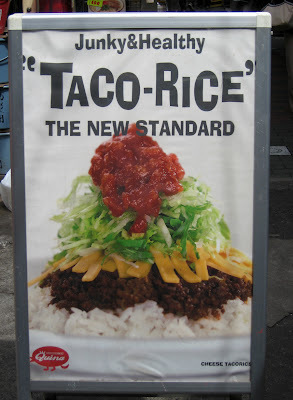 This sign becomes even more confusing when you realize that "tako" means "octopus" in Japanese. Harry surprised me this morning with not one, not two, but five finely knit swatches for Heirloom Knitting's Princess shawl. He managed almost all of them on Clover #0 bamboos--the loathsome joins weren't an issue, as the swatches were only 19 stitches wide. These needles would be useless, however, for any project that required sliding the stitches over the join. Forget it. You'd spend more time tugging stitches over that sharp little barrier than you would actually knitting anything. Whoever designed these needles clearly never knit anything with them, never did any market research, and certainly never ran a finger over the finished product. Pros: Comes in 23 pretty colors (mostly earthy browns and beiges) and the entire order will be wound on a cone, so you don't have to deal with joins. Cons: Slightly sticky and splitty. Not as pleasant to work with as Heirloom Knitting's Gossamer Merino. Actually, it took three tries to produce this swatch. I cannot imagine trying to knit a shawl with it. Well, I can imagine it, but I think jogging from Tokyo to San Francisco would be easier. 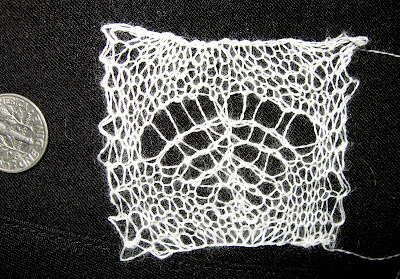 Cons: Available in natural off-white only, shrinks vertically after blocking square. 16 ounces will circle the Earth. You can figure out the Tex numbers yourselves. 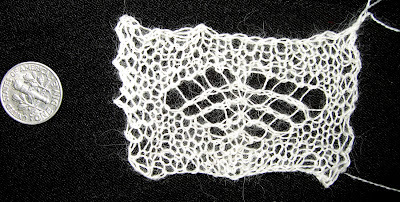 Harry swatched this with #25X 0 needles in lime green, so we could find the sample to photograph. This sample is enlarged about five times actual size. Pros: Produces a fabric so fine that the final shawl will fit through the eye of a #12 quilting needle. Comes in 175 colors and is inexpensive if you have a whole lot of production spiders in residence. 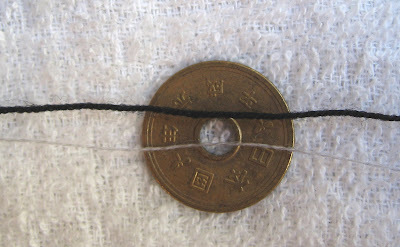 Cons: Quite sticky--we caught five gnats while blocking the swatch. Well, more top-to-bottom, but you can see the relative sizes of the swatches and the yarns from these two photos. Click on the thumbnails for a less-blurry view. I would love to swatch Yarn Place's Heaven and Angel--I think these may be fine enough to enter the Princess Swatch contest. 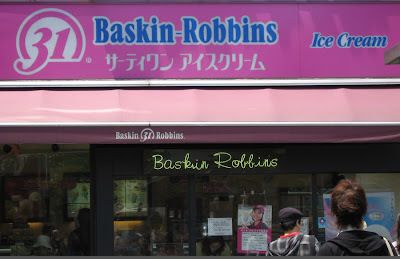 Unfortunately, I don't have any here, so the swatches will have to wait until I return home. Ditto ColourMart cobweb yarns--I don't have any with me, but they always have cobweb cashmere and cashmere/silk yarns in stock. Lastly, there are the skeined cobweb yarns offered by Skaska and Dimity. On the plus side, skeins can be easily dyed. On the other hand, winding them into usable balls would surely make Job yearn wistfully for whale tummies (mixed reference here, yeah yeah, Jonah was the one in the whale). I have some of both and they are resting comfortably 8000 miles away. The morning began, inauspiciously, with an snarly little argument. Harry crouched grumpily on top of my suitcase, demanding that I take him with us. I pointed out that Japanese trains are exceptionally crowded and he didn't have much of an exoskeleton to prevent, erm, squishing. After some insults were exchanged (Leg-Challenged Biped, Flies for Brains, etc.) we compromised by having Harry travel in a super-sized Altoids tin. It crossed my mind, as we stood for two solid hours in over-crowded trains, that I could clear the car quickly if I released Harry from his pet carrier. But Kyoko-san, my travelling companion, pointed out that Harry was still relatively small, even if he is a Kurenai Kai Giant Spider. I spent some minutes squashed between two Sumo wrestlers on the way to a tournament, mentally designing a spider-sized Samurai outfit, complete with eight swords, chain mail, and one of those wicked-looking helmets. Perhaps the sight of a spider fit to kill, as it were, might send everyone screaming into the next car. On the way to Avril, we stopped at a store that sold nothing (be still my heart!) 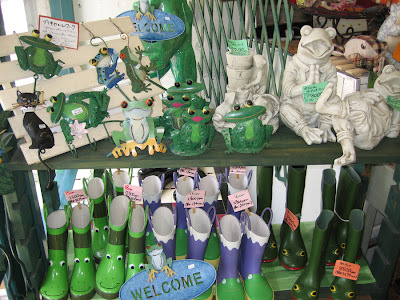 but frogware--boots, napkins, earrings, towels, incense burners, and watering cans. I didn't buy anything, although if the boots had been in grownup sizes, I would have snatched a pair for the rainy season. Mud is shin-deep at Kurenai Kai when it rains. Harry fell asleep inside one of these flower pots. 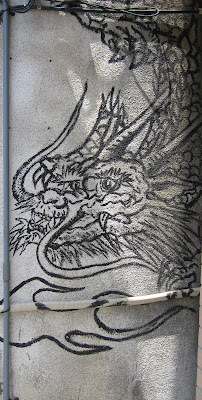 And, still on the way to Avril, I took a picture of some cool Japanese wall graffiti. Avril is a tiny shop, into which they pack enough yarn to keep most of Tokyo supplied forever. 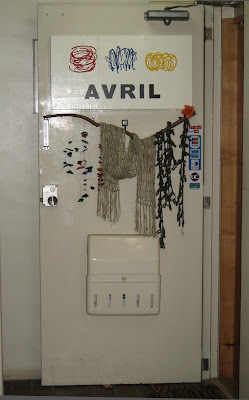 There was yarn on the walls, the ceiling, under the tables, and in small baskets such as this one, full of paper yarns. 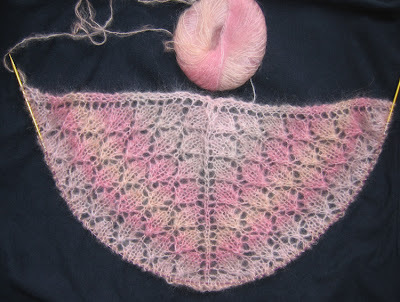 It was a bit difficult to maneuver around, but I plonked down in front of the section holding lace yarns and spent a good thirty minutes poking, prodding, fondling, and so on. Eat your hearts out, everybody. Harry insisted I purchase this skein of hand-painted laceweight cashmere, then he promptly fell asleep on it (he's at the back of the skein). 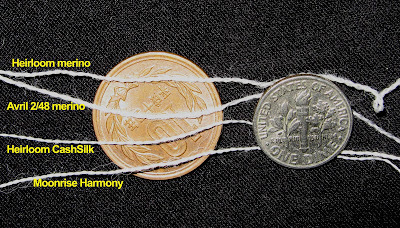 Yarn is sold by the gram (there are 28 grams in an ounce), but the prices were not outrageous. I didn't buy wads of stuff, but at Harry's insistence, I purchased 10 grams of 2/48 merino to swatch for the Princess shawl. The clerk wound it on a cone! Wow! I hope he has a grand time with it--it's almost invisible. Here's a comparison. At the top is the black Gentle that I am currently using for the Spider King shawl. Good luck, Harry! 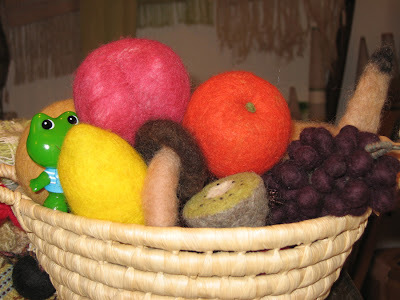 Of course, this being Japan, 2007, there was a basket of felted fruit on the counter. Harry took a nap on the grapes. I was beginning to get worried at all the snoozing. Harry reminded me that he's been keeping a night schedule as mutually agreed upon years ago, so I could hardly complain. 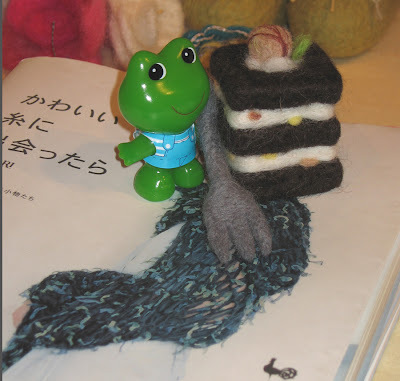 And what would a Japanese yarn store be without felted tortes? 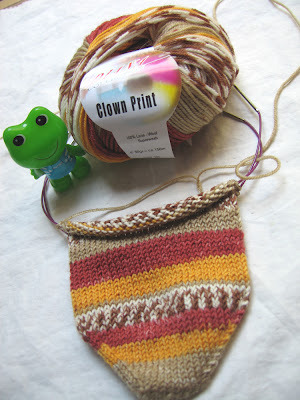 I bought one hilarious knitting book, which will feature in another post, and a bit of two delicious mohairs. This is 75% mohair, 25% nylon. And this is 40% silk, 60% mohair. It feels like clouds. 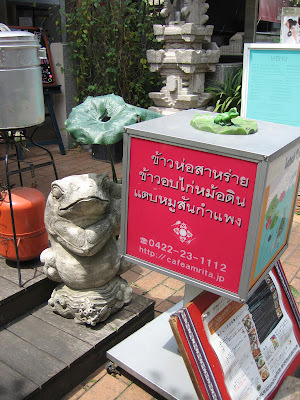 We ate at a Thai place awash in frogs--one holding the sign, one on top of same, and a frog plate to place your payment in front of the register. Frogs are everywhere in Japan, apparently. My knitting get nervous here. 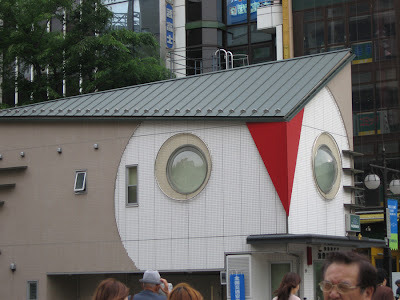 From Kichijoji, we took several more trains to Puppy Yarns--a big disappointment. About the same size as Avril, the store had more Rowan than Puppy. There was a decent selection of books, but I have all of the masterpiece publications and nothing there caught my eye. We did, however, determine that Richmore magazine subscriptions are not available outside Japan. Sigh. Finally, we trained to Ikebukaro, where our hotel and a Mexican dinner awaited. The Grand City Hotel is not terribly grand, but reasonably priced and quite comfortable if you happen to be about Harry's size. The room was slightly larger than an Altoids tin, but somehow the designers managed to shoehorn all the amenities inside it, including a teensy refrigerator, desk,TV, pink powder puff, and, of course, a foot-massaging machine. Harry spent most of the night giving the gizmo a real workout, even though he didn't do any walking. The only complaint about the room was the, ah, scenery. I opened the window, only to discover that the room overlooked a large batting cage...my dreams were punctuated by the constant Pock, Pock, Pock of baseballs being whacked into the netting six feet from the window. Between the the baseballs and the floopity-floop of the foot massager, I didn't have the most restful night. The next morning we trained (surprise!) to Okadaya, a large store specializing in fabric and yarn. The basement, for some reason, is given over to ladies' lingerie, all of it over-garnished with lace, frills, rhinestones, and in one case, printed apples. 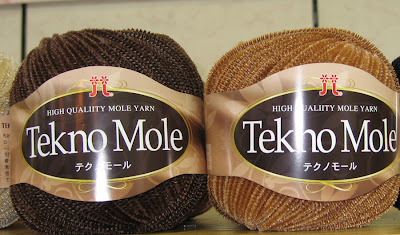 High-quality mole yarn? Chenille, in Japan, is called mole. I guess that's no worse than the bookstore chain here called Wonder Goo. 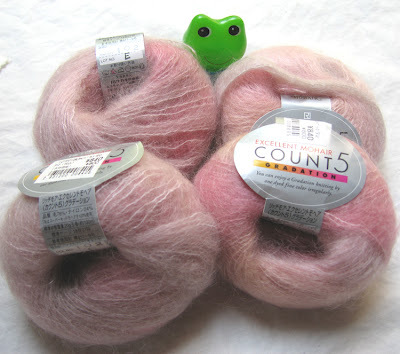 I found a new Count 10 colorway--lovely mauves and beiges. At this point, it shouldn't surprise anyone that the knitting section was awash in crochet books. Nothing much for me. And alas, there were no chairs, so when our feet started to hurt, we left and went to Kinokuniya, which doesn't have chairs either. 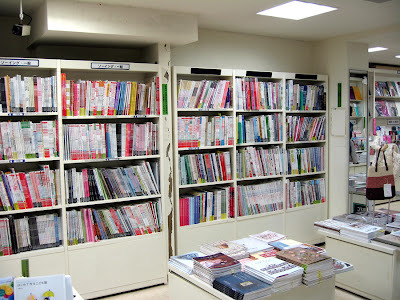 Japan has much to learn about browse-friendly bookstores. A wonderful time was had by all, and we got to sit down on the bus ride back home. Cover Designer Loses the Plot! 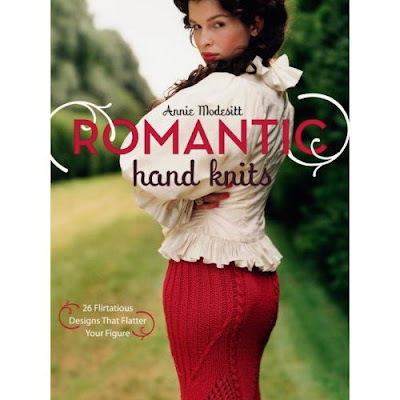 The subtitle to this book is 25 Flirtatious Designs That Flatter Your Figure. Um. I don't know about you guys, but I don't want marshmallow arms and a protruding posterior with a tail wandering down the skirt. Mind-boggling image selection filed under the category of "What Were They Thinking?" Yes, despite all the to-ing and fro-ing going on here, I really am still knitting. I try to finish a row of Black Widow every day, although this past week's rows had so many P3 togethers--left slant (vicious!) I was lucky to get half-way around a single row in an hour. I finished a pair of socks last week for Roy. Good airplane knitting. The yarn is Cherry Tree Hill--I think the colorway is Green Mountain Madness. I love that yarn, but I swear the new stuff is heavier than the old stuff. I made a pair last year and that yarn looks to be about 25% finer than the newer skeins. 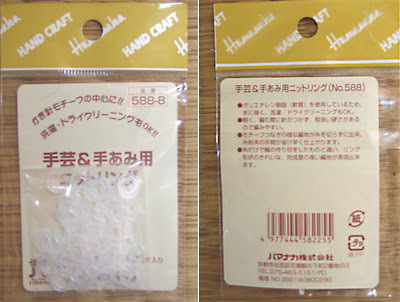 I bought the yarn shown below last year in Chiba. It isn't so wonderful, but it was apparently one of the only skeins of sock yarn in the entire country, so I snapped it up as a rarity. It says it was made in Italy by a company named Diana, but it sure looks and feels like a Regia clone to me. I have also been experimenting with seamless circular booties. Several experiments look fairly wearable and require no sewing, short rows, grafting or other painful contortions. I'll try to write out the patterns this week. Speaking of this coming week, my friend Kyoko-san has organized a complex two-day yarn crawl across Tokyo. Between us, we located every yarn store in the entire city, and she has carefully mapped out our route to maximize in-store browsing time. For such a large city, Tokyo has surprisingly few yarn stores. But I am really looking forward to Avril, which is the supplier for Habu. I promise to take pictures this time. Really. 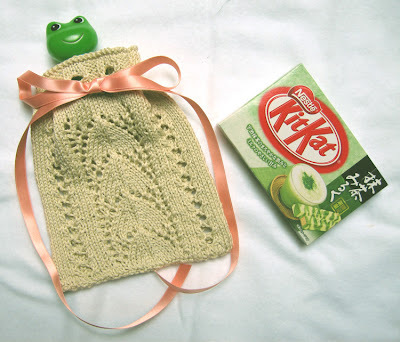 On the left, we have the finished lace bag from KnitPicks and, on the right, yes, that's right folks, it's a box of Green Tea KitKats! Yum! The ribbon I originally purchased for the bag was too wide, so I snitched the ribbon for the booties and used it instead. Oh well. Back to the ribbon store at some point. Nothing ever seems to come out even around here. This was a quick knit--only a few hours, and of course I modified it by knitting the bag circularly and working the lace panels on both sides. Froggie looks comfortable in there, doesn't he? 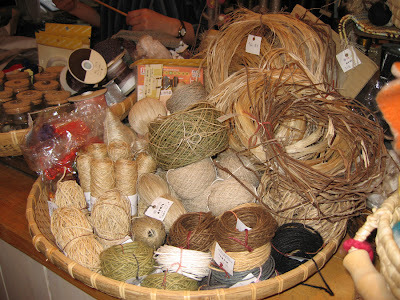 I didn't acquire much at Yuzawaya, despite the fact that I spent two hours grazing around the yarn section. All of their yarn is stored in plastic bags, which is good for dust, but not terribly tactile. You can't just wander down an isle, poking and prodding....each bag has to be opened, yarn withdrawn to see the color and feel the texture, replaced into the bag, put bag onto shelf, move to next bag. Takes time and isn't as much fun as the Naked Yarn method used in most other places. 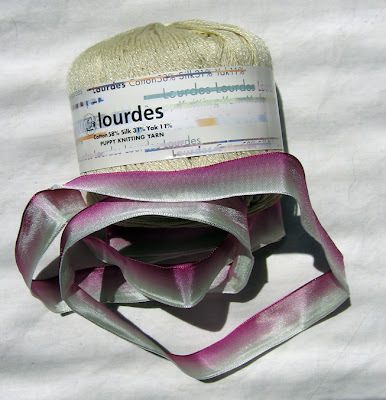 I bought a ball of Puppy Yarn's Lourdes, which has the interesting composition of 58% cotton, 31% silk, and 11% yak. It's quite soft and has a lovely sheen. 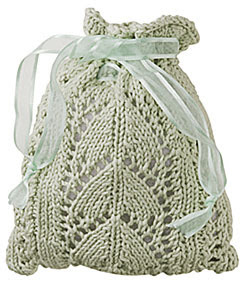 The pattern for this sweet little bag is a freebie from KnitPicks, and you can download it here. 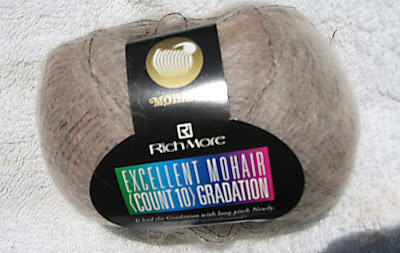 I also succumbed to four balls of Count 5, a Richmore yarn of 76% mohair and 24% nylon. 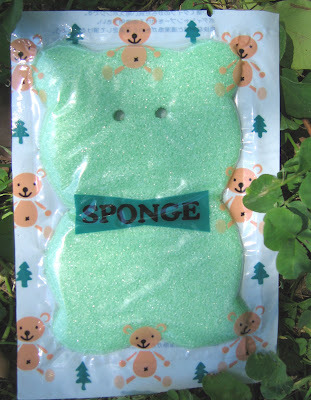 It is way softer than Kidsilk Haze and comes in the most delicious colors. They also offer Count 10--a finer version of Count 5 in the same colorways. 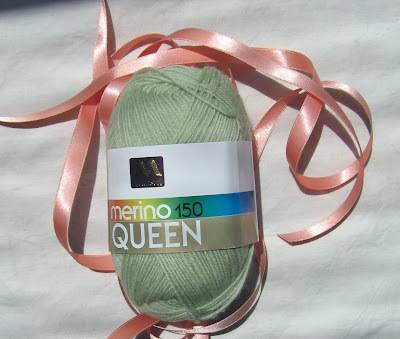 And, as there are two new babies brewing here at Kurenai Kai, I bought a ball of gender-neutral green merino for booties. I love this yarn. It comes in three weights and 75 colors, and alas, can only be purchased at Yuzawaya--Munsell is their house brand. I swept up every available package of my favorite stitch markers. They actually aren't stitch markers at all--I think they are supposed to be centers for crocheted doilies. Whatever. 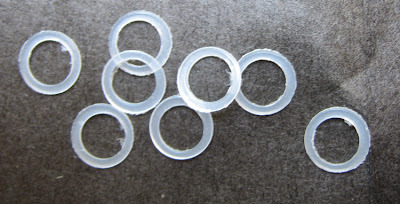 They are exceptionally small and thin and don't sproing off my needles like those little rubber band thingies I tried a while back. 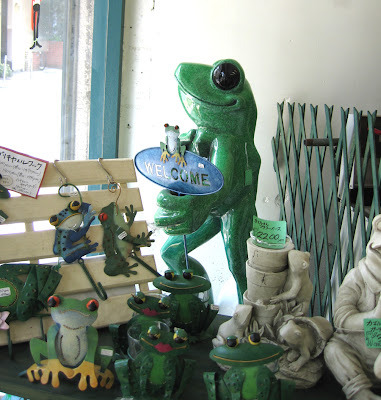 And finally, I didn't purchase the little frog shown with the mohair--he and his buddies were being handed out in front of the Chiba train station by somebody dressed in a gigantic spherical Earth suit. Froggie was in a little bag with a package of tissues and a colorful brochure which, unfortunately, I couldn't decipher. 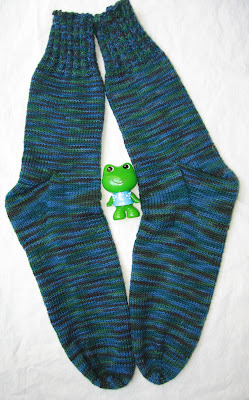 I was truly delighted, as I have no other frogs here, and what is a blog posting without a frog somewhere, right? As I creep my way up the chart for the Black Widow Spider King, I have been encountering Too Many Knots in my balls of Gentle. The other day I was finding a knot about every other row. As I was almost at the end of the ball, I decided to start the second ball I brought with me. Now I am encountering knots every row. I can understand one or two knots per ball, but this is becoming ridiculous. Not much I can do about it but grit my teeth, because first, I don't have any more black Gentle here. Second, Yarn Place's web site has been a mess for months. You can't order anything, even if you could find what you want amidst the weird slide show thing that now passes for a "store." And third, even if I could order more and have it shipped to Japan, it won't be the same dye lot. If I continue to encounter more knots, I am afraid that I will be unrecommending this stuff for anything more than swatches. Well, it was a fruitful day. And I do mean fruitful. The newest Japanese Craft craze appears to be making fruit (and other comestibles) out of fiber. 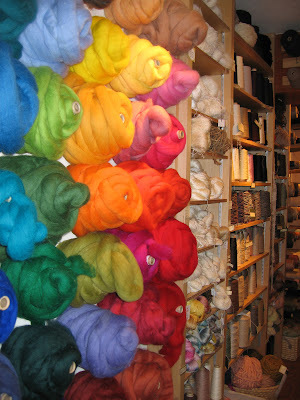 At one point, as I wandered down an aisle inside the Yuzawaya craft store, I felt (no pun intended) that I had been transported inside a refrigerator from the Planet Zark, surrounded as I was by stacks of felted fruit and crocheted vegetable kits. At least ten feet of shelf space was devoted to Felted Food, including an awesome strawberry meringue cake and a rather fetching felted cheeseburger. I was getting hungry. I gazed with considerable admiration upon a crocheted bowl filled with crocheted green peas, topped with a crocheted butter pat. But I was not inspired to whip out my wallet for either this kit or the the rest of the panoply of Fake Food. The really bad news is that this summer in Japan, Crochet is the New Knitting. My perusal of Yuzawaya's knitting book section unearthed 20 crochet books, all lurking inside covers titled Let's Knit or Summer Knits. Clearly, there is some confusion on the part of the publishers about what constitutes knitting. Especially depressing though, was the total absence of cool stitch dictionaries to leaf through. The closest thing to knitting I could locate were a few dusty Women's Day knitting mags from 1992. Guess the Yuzawaya worker bees were cleaning out their hive. A visit to a nearby bookstore produced 37 crochet titles, two uninspired books of baby knits, and 6 books bursting with felted and/or crocheted food. Now I was definitely getting peckish from staring at all these inedible edibles. After I yanked yet another Felted/Crocheted Zakka volume out of the tightly packed shelf, causing about 150 slippery books to explode onto the floor, I figured it was about time to find some non-felted food. I have nothing against crochet--I know how and used to do it. But none of the designs I saw made me want to grab for a hook. They were Truly Awful. There was one memorable black shawl that looked like a gruesome spider web draped over the poor model. 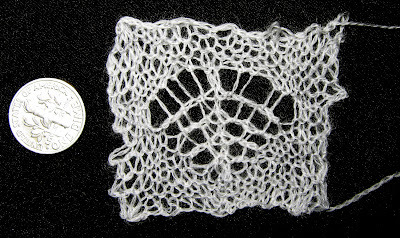 The rest of the designs emphasized granny square sweaters or pineapple doilies. The yarns at Yuzawaya were even less interesting than the books, which is to say, there was no sock or lace yarn, lots of knitting worsted, and some plain cottons in tastefully boring colors. Boy, did they have a big stock of crochet cotton, though. 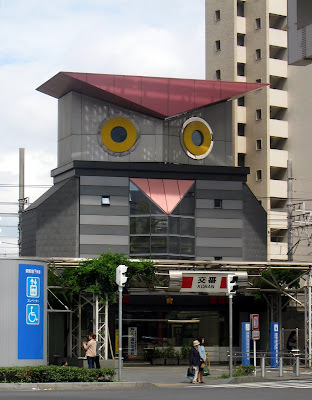 I'll post some knitting pictures later tomorrow, but for now, please gaze upon a Chiba police station. None of our Public Safety officers have a sense of humor like this!